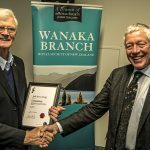 NOTICE is hereby given that the Annual General Meeting of the Wanaka Branch of the Royal Society of New Zealand will be held on 6th May 2016 at 7pm (immediately following the address by John Darby) at the Presbyterian Community Centre, 91 Tenby Street, Wanaka. Subscription. Unless changed by resolution at the meeting the annual subscription will remain unaltered at $10 per household and the meeting attendance fee at $5 per person, with no subscription or meeting fee payable by student members. Election of Officers; Branch President Branch Vice-President Treasurer Secretary Liaison Officer Election of not more than 2 committee members in addition to the officers.